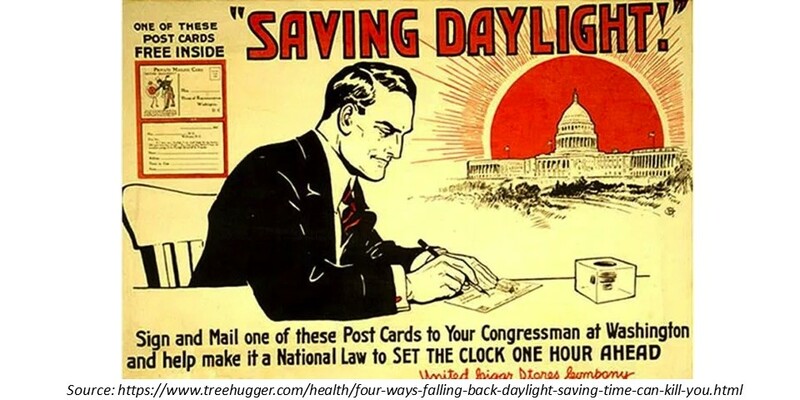 Home /Blog/What does Daylight Saving Time really save? 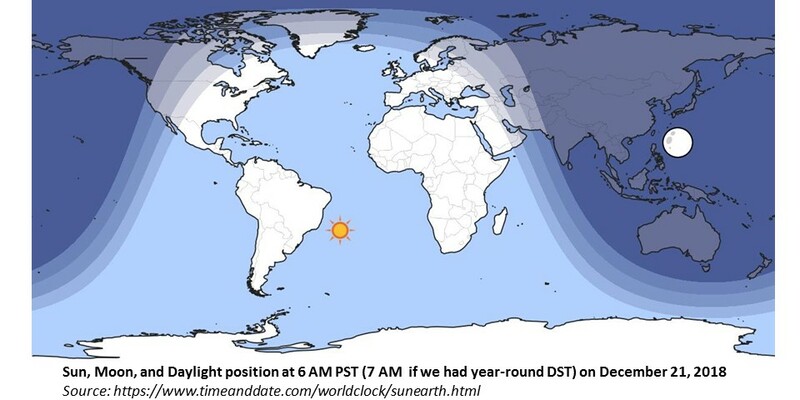 DST can coordinate societal shifts to better use of daylight…but at a cost. You would think most states have more pressing issues to confront these days, but legislation on the measurement of time is one of the perennial favorites in our nation’s legislatures. There is always someone passionate about the horrible costs or enormous benefits of Daylight Saving Time (DST) (or, closely related, the “correct” time zone for their state). In the last few years, more than a dozen bills have been introduced to change a state’s adherence to DST. This year, California has gotten into the game (and not for the first time). Assembly Bill 807, signed by Governor Brown last week, is a first step in a multi-part process that could eventually undo the state’s 1949 adoption of Daylight Saving Time. Advocates argue that it would avoid the semi-annual clock adjustments that disrupt our sleep and schedules, and that it would reduce energy use. These proposals trigger the retelling of the probably-not-apocryphal story of the gardener who remarked that DST is wonderful because the extra sunlight makes tomatoes grow faster. 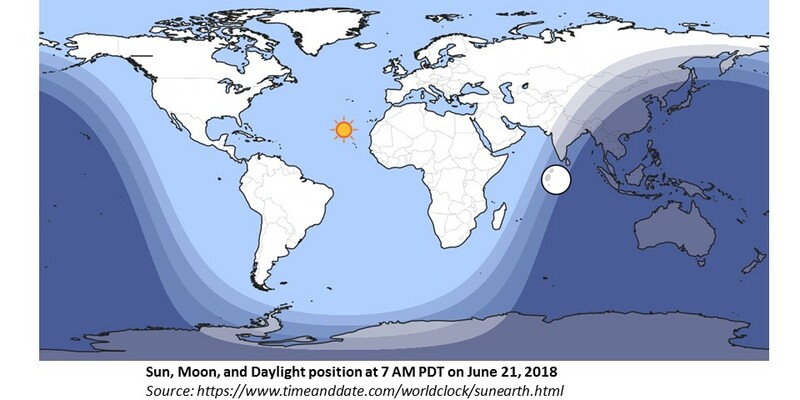 Let us now pause to chuckle smugly, because we all know that DST does not change the amount of light any location receives over a 24-hour period. Many of us, however, seem to think that the timing of human behavior is as immutable as the rotation of the earth. Op-eds, office discussions, and even news reports on the subject are filled with assertions that changing how we designate time necessarily gives us more or less time for some outdoor leisure activity, or means that we will engage in some task when it is light or dark. Benjamin Franklin argued that DST would save energy (you knew I would get around to an energy angle), and many policymakers today use that argument to support the practice. But two excellent studies (here and here) have found essentially no impact on energy consumption. There are many reasons, but surely among them is that humans can adjust their schedules to a renaming of the hours. But wait, you say, I can’t simply adjust my schedule, because it depends on the schedules of dozens or hundreds of other people — my family, my coworkers, the operator of my neighborhood coffee shop, whoever controls the start time at my kids’ schools,…– and we would all have to coordinate on the readjustment. That’s right!! The numerical designation of hours is completely arbitrary, but it is still crucial for coordinating activities. That’s why there are real benefits to adjusting those designations as the amount of daylight changes over the seasons. In December, when we get about 9½ hours of daylight in Berkeley, we need those hours to accomplish everything our busy lives demand, so most of us (reluctantly) start our days before the 7:21 AM sunrise. But in the June, when we get 14½ hours of daylight, maintaining the same clock schedule would mean waking up hours after the 4:47 AM sunrise. 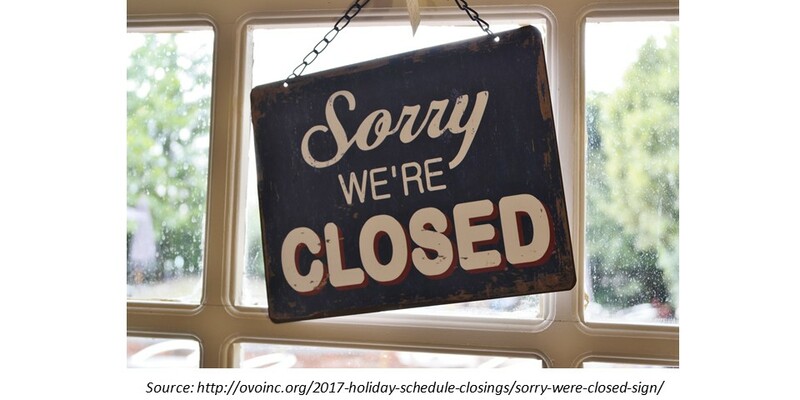 We’d like to shift our schedule to start the day earlier in the summer, but not if stores are closed, our work hours are unchanged and our favorite morning radio/TV shows haven’t started yet. DST is certainly not costless. The shifts between DST and Standard time are jarring for many people. Research suggests there may be a rise in heart attacks, auto accidents and other health risks on the day after the changes, particularly the March spring forward, when we “lose an hour.” But sticking to a single time would also have adverse effects, effects we can’t measure very well today, because most of the country has been on DST since at least the 1960s. Permanent DST would likely lead to more pedestrian accidents on winter mornings, as more adults and children venture out in darkness, with the sun rising as late as 8:21 AM in Berkeley. Permanent Standard time would likely reduce sleep hours on summer mornings as daylight pours in before 5 AM, with adverse effects on health, as well as leaving less evening time for outdoor exercise and leisure. Plus, there would be increased costs due to coordination failures. More workplaces, restaurants, stores and schools would establish their own idiosyncratic summer and winter hours in order to adapt to the seasonal changes in daylight. 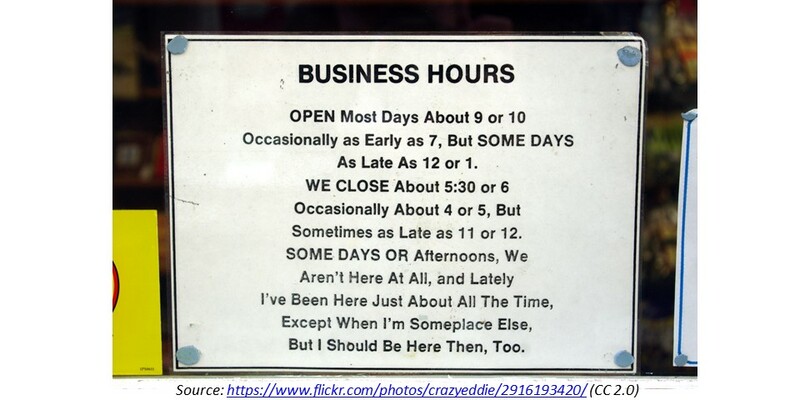 (Many hardware stores and restaurants already do this, even with the current DST shifts.) This would create a multitude of problems for the workers, students and customers who also have to deal with other institutions that would not change their hours or would change them differently. And that’s even when the changes are communicated well to the relevant people. Inevitably, there would also be an increase in workers, students and customers arriving to find closed doors, because they forgot to check operating-hour changes. DST’s energy impact is likely miniscule, but there are weightier arguments for and against it. I suspect that most people prefer Standard time in the winter and DST in the summer, but hate the transition between them. Still, sticking to one or the other year-round would lead to inconvenient timing of many activities or, in many cases, would increase uncoordinated seasonal schedule changes, reducing the fundamental value of standardized time. Are the disruptive twice-yearly transitions worth it to maintain better coordination? That’s the debate we need to have about daylight saving time.